It's no coincidence that the company that makes PureAyre is named Clean Earth. 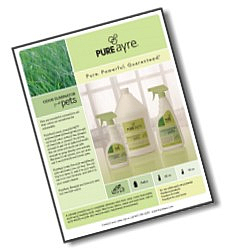 Not only does PureAyre eliminate odors; it literally cleans the air so people and pets can breathe easier. 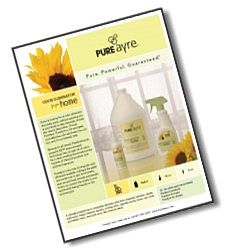 Until PureAyre, your alternatives were bacteria-laden odor eliminators, “fresheners” full of synthetic fragrances, and dangerous ozone generators, none of which are completely safe. Clean Earth didn't improve on nature to bring you PureAyre. But Clean Earth does use modern technology to bottle the plant-derived enzymes that eliminate odors. The result is an all-purpose, easy-to-apply natural odor eliminator that gives you healthier, cleaner air without any harm to you, your pets or the planet. PureAyre is 100% biodegradable. It does not deplete the ozone layer or contain any harmful propellants such as propane or isobutene. It can be safely used around children, the elderly, pets and even birds. 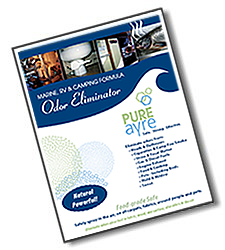 When you use PureAyre to eliminate odors on your boat, you won't put anything harmful into the marine environment. 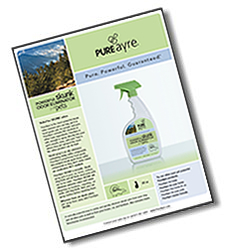 PureAyre lets you control the smells in your environment while being friendly to the environment.